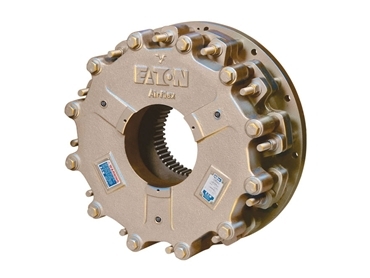 Eaton Hydraulics Group Australasia presents Model DBB brakes from Airflex. Airflex DBB brakes are spring applied, pressure released disc style brakes that develop equal torque in either direction of rotation. Their torque and thermal capacities allow them to be used in some of the most demanding applications. Model DBB brakes are used in bottling equipment, power shovels, draglines, conveyors, shears and power presses. Pressurising the brake compresses the brake springs and withdraws the clamping plates from the brake discs. Standard brakes are furnished with multiple discs, which are free to move axially. Model DBB brakes use a conventional piston design to release the brake discs. The rotation component of the DBB style brake is a very low inertia friction disc core with riveted friction discs. The low inertia of the rotating components coupled with the high heat sink capacity of the stationary members allows these units to provide superior performance in high cyclic applications. The DBBS style, which utilises a solid rotor and stationary friction material, is offered for applications requiring higher speed operation or where precise balance of the rotating components is required. Similar to the DBAS design, the DBBS should only be used for applications where brake engagement is non-cyclic.